The DynamoDB Playbook is a compilation of common problems faced by teams and developers, using the service in Production, and effective solutions to address those problems. If you are using DynamoDB, or considering it, this is a must watch! 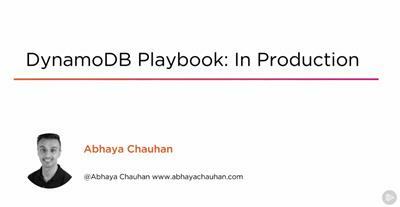 This course, DynamoDB Playbook: Using in Production, will help you to understand effective solutions to the common problems teams and developers face. First, you'll learn about backing up and storing data. Next, you'll get a look at supporting global applications with cross-region replication and global tables. Finally, you'll touch on monitoring DynamoDB, migrating to new tables, and fine grained access control. After watching this course, you'll have some strategies in working with a service in production.